Going to the doctor’s and getting a prescription isn’t the most intriguing or exciting activity of all. But it could be. If you replace the cold doctor’s office by a noisy and warm street shop, and the expensive pills by colorful herbs and delicious berries, you get a traditional medicine shop. 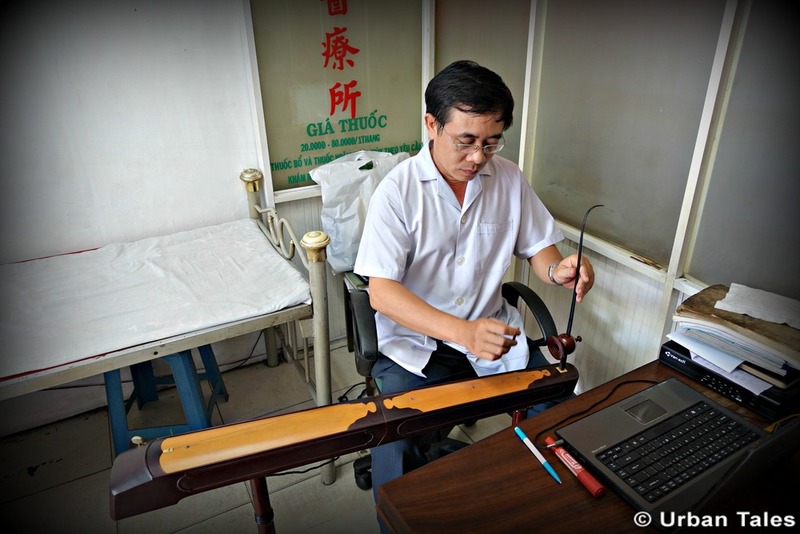 Every year, these traditional clinics treat thousands of Cho Lon residents using only Vietnamese herbs and traditional infusion recipes. 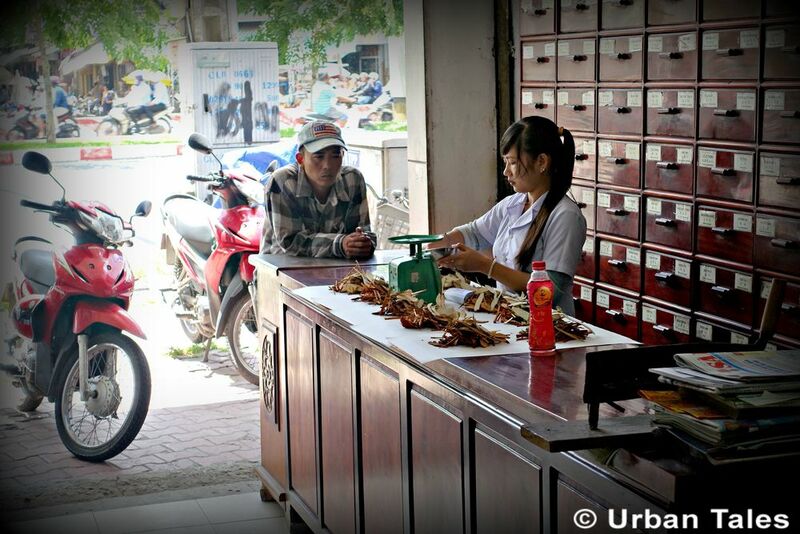 These traditional medicine shops are extremely popular in Vietnam. 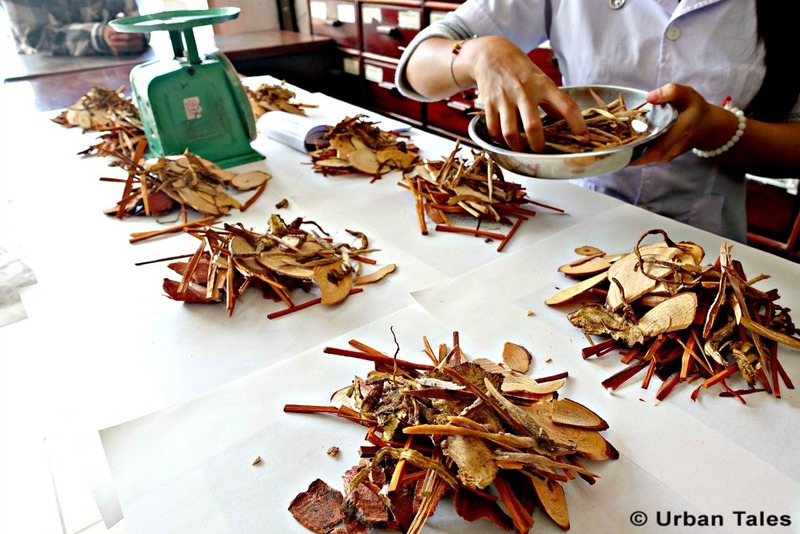 Cheaper than modern treatments, those herbal cures are, in some parts of Vietnam, a necessity, as even basic western medicines like antibiotics are either unavailable or too expensive. On the other hand, we can observe that traditional medecine is getting more and more popular among middle classes and foreigners who find their way to the traditional physicians either because Western medicine is not working for them or because they are skeptical about the adulterated medicines which can be found here. There is an increasing interest in using traditional medicine to supplement treatment of chronic illnesses. 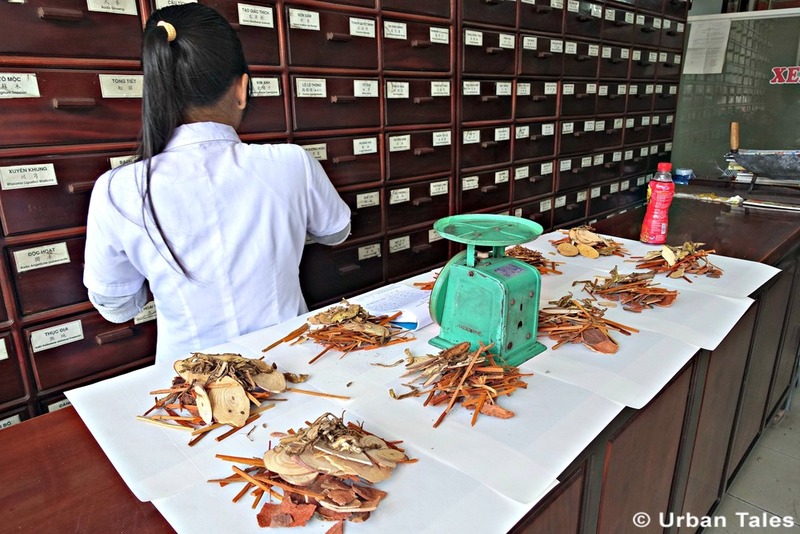 Traditional medicine is part of the cultural heritage of Vietnam and it’s interesting to notice how, nowadays, modern and traditional approaches co-exist in the national health system. 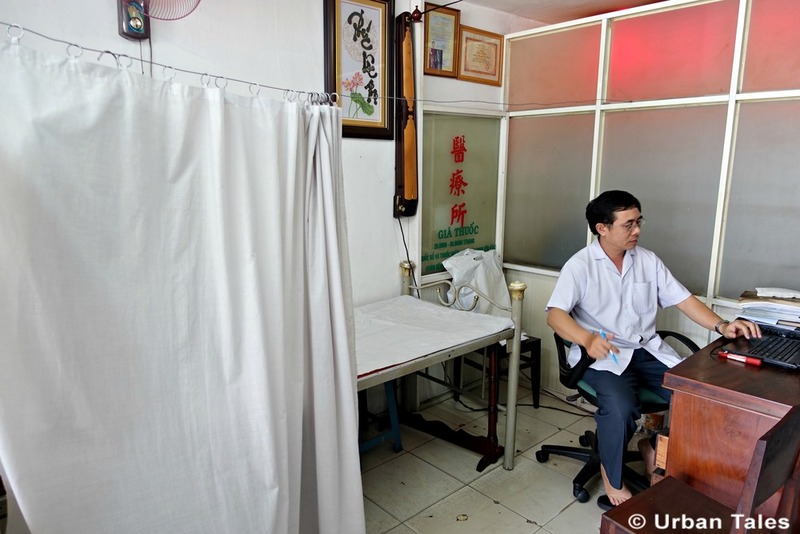 In the Traditional Medicine Institute of Ho Chi Minh (Viện Y Học Cổ Truyền), modern diagnostic tools like x-rays, scans, etc. are used together along with herbal and traditional cures. Vietnamese traditional medicine focuses on treating the underlying conditions whereas modern medicine tends to focus on the symptoms. They are compatible and work well when used together. But let’s not wait any longer, and actually go to a traditional medicine shop. We picked one not far from the river, in south Cho Lon. Here, the consultation is always free, no matter the health issue. Patients only pay for treatment. The price will vary depending on the herbs prescribed. 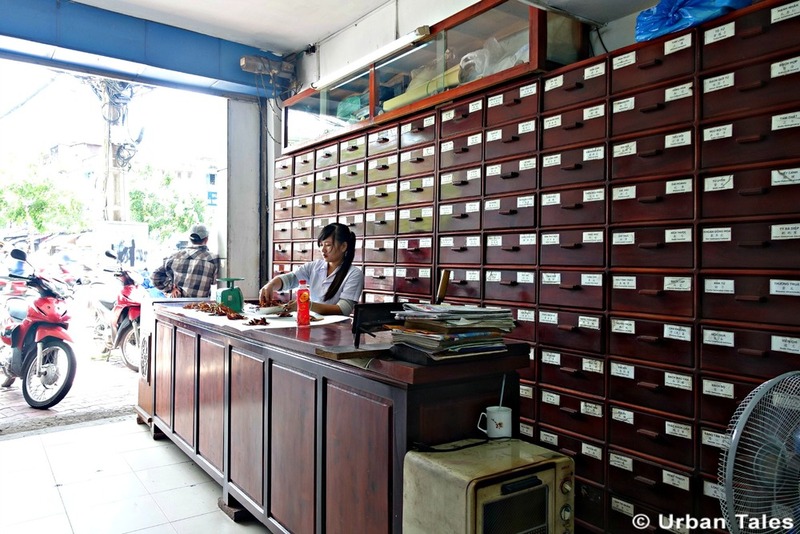 In this medicine shop, it says right on the wall that patients will usually pay between 20,000 and 80,000 VND for the medicine package they will get. The doctor was there and agreed to meet with us, even though we were feeling pretty good… This lovely man has been working as a traditional practitioner for more than 25 years. He graduated from the Faculty of Traditional Medicine of HCM (Khoa dược y học cổ truyền TPHCM) and he hung his degrees on the wall, like any Doctor would. 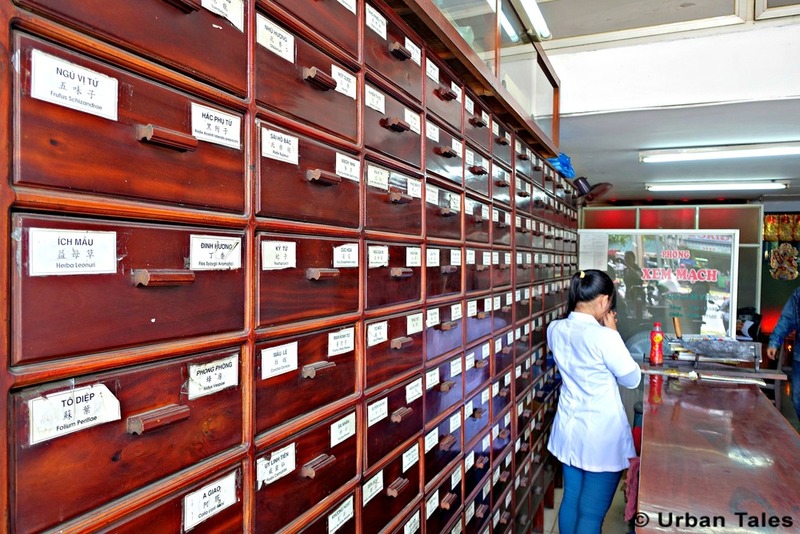 In the first part of the shop, you can find a typical large wooden pharmacy cabinet with lots of drawers, each labeled and placed in a systematic order. At the back is the consultation room where people meet the doctor. Patients seat down to tell him about their ailments. If necessary, he can examine them behind a curtain. Feels almost like a modern doctor’s office, apart from all the herbs of course. After he gets to understand the patient issues, the traditional doctor will write a prescription for a remedy. The herbalist at the counter reads the prescription and accordingly picks up all the ingredients of the concoction found in the hundreds of meticulously labeled drawers. She then puts it into packets to be brewed at home. Everything is measured and weighed. Each herbal medicine prescription is a tailored-made cocktail for one patient. 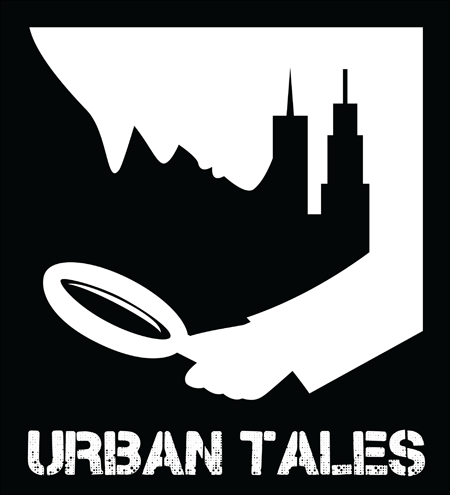 If you want to have your own experience of a traditional medicine shop and maybe discover what kind of herb-mix will improve your health condition, book our self-guided tour and come investigate the strange case of Dr Lam!